Very cute semi-spoof of Star Trek drivel and its fans. Good effects, good cast. Ok for kids too. Just good fun. Tim Allen plays the star of a hit Science Fiction TV-drama - presumably mimicking Star Trek - whose programs have been unknowingly transmitted to a far away galaxy. A group of aliens under attack have intercepted the entire TV-series and believe the programs are actually "historical documents" of a courageous crew and seek out the Allen and his wacky crew to help. It pokes fun at the die-hard sci-fi fans - again, obviously, this is meant to be a good-natured shot at Star Trek's "Trekkies". I'm guessing that if you're one of those you'll get a good kick out of that aspect of this movie. I'd like to also note that Sigourney Weaver is pretty hot in this movie, and looks 10 times better as a blond. Hehe. Not an uplifting movie experience but Zach Braff does quite well for his debut behind the camera. And Natalie Portman? Well, she's just too cute. John Travolta is an excellent actor as is everyone else is in this movie. It has a few scenes which are hard to watch because they are so graphic. Overall a definite thumbs up, and worth going to 2 video stores before I could find it to rent. Does John Travolta ever give a bad performance? There is no disappointment with the acting in this movie. The plot is complicated but not too scattered. This is a very well done and well thought out "who dunnit?" The murder occurs early in the movie and the remainder is full of interesting clues and tie-ins to a wide variety of characters leaving you guessing and on the edge of your seat, wondering not only WHO did it, but WHY they did it and how are all the characters involved in what transpired. As the story moves towards its conclusion you realize that this is no ordinary murder! A quality film. This was an interesting, thoughtful, soulful movie. Before I go on, I need to say that it was not the proverbial "chick flick." Matt, my boyfriend, agreed to see it with me and enjoyed it. The movie was made in Harrisburg and that is where I went to high school. The movie is set in Boston, so I was curious how they were going to do that -- it worked. Most scenes are in a mental institution. She sits by the river in one scene -- you might think it is the Charles, but it is actually the Susquehanna. ANYWAY, now for the review . . .I can't finish. . .Chris is staring over my shoulder and he wants to play on the internet. Gotta go. Like "Dead Poets' Society," "Girl, Interrupted" explores young people in an earlier era, grappling with issues of peer relationships and various kinds of authority. Also like "Dead Poets' Society," "Girl, Interrupted" is generally well-filmed and well-acted by both smaller ensemble players and the leads. The "girl" of the title is young Susannah Kaysen (Winona Ryder, who also co-produced), a depressed and withdrawn child of affluence. After a suicide attempt, she is "voluntarily" committed by her parents and unscrupulous psychiatrist, more out of embarrassment than caring. At the state mental health facility for young women, she is forced to choose between acquiescence and treatment--represented by the hospital's much-better psychiatrist (Vanessa Redgrave)-–and rebellion, personified by a domineering and magnetic psychopath (Angelina Jolie). Ryder has developed considerably as an actress since her famous role in Heathers (a part and a plot somewhat similar to the one in this movie) and she thoroughly explores and personalizes a character who is not always easy to deal with. She is helped by a script that packs a punch by not idealizing mental illness or those who suffer from it, perhaps reflecting the personal experiences related by the real Susannah Kaysen in her book (on which this film is based). Jolie is amazingly well cast, an excellent foil to Ryder, even if she occasionally overacts when she is handed contrived opportunities to do so (virtually the only fault of the film). See this. A movie - based on a true story - about an intelligent 18-year old girl (Ryder) suffering from depression who is thrown into a women's mental institution for attempting suicide. The institution, filled with a varied array of people legitimately insane, proves to be clearly inappropriate for someone with her illness. She quickly befriends many of her fellow patients, errantly picking up many of their traits. Then begins an emotional view of the struggle she has to find her sanity and independence in an effort to demonstrate she should no longer be institutionalized. Angelina Jolie absolutely steals the movie as a manic, manipulative sociopath whose moods constantly swing from the extreme end of anger to the extreme end of mischievous. It is Ryder's relationship with Jolie's character that is the crux of the film. Jolie's character had to have been an extremely difficult role, but she was both fantastic and flawless. Jolie deserves every bit of the critical acclaim she received for her part. Whoopi Goldberg plays the nurse at the institution. Whoopi is a fine actress but, is it just me, or does anyone else have a hard time taking her seriously? Maybe it's her name - I see her face, I think "Whoopi" and it makes me feel like I should be laughing. Doesn't matter much here since she doesn't have a very large role. In summary, the movie was interesting and very much above average. You definitely felt for her situation, the fear, confusion and isolation. Her developing relationships with the others in the movie were thought provoking. Highly Recommended. The setting is the Roman Empire in 180 A.D. Russell Crowe plays Maximus, one of Rome's great Roman generals and all around good guy - loyal, noble, righteous, well-respected, infinitely charismatic, not to mention the most dexterous man on earth. He has just fought what he hopes is his last battle - this one the great war against the barbarians in Germania - and hopes to return home. His plans are turned upside-down when the Commodus (Joaquin Phoenix) takes over the Roman Empire. I won't give you much more than that so as to not spoil anything for those who haven't seen it. Gladiator is an epic thrilling exciting adventure for all audiences that never losses interest. It's hard for me to imagine anyone not finding this movie to be completely awe-inspiring. The writing and the story is top-notch, intelligent and totally believable, and the acting is totally unbelievable. The complex characters, dialog and situations all feel legitimately authentic. You'll find yourself routing hard for Crowe by mid-movie, while Phoenix plays a tremendously effective tragic villain that will create churning stomach every time he appears on screen. Even the lesser characters in the movie - Crowe's friends, Phoenix's sister and father (Oliver Reed) - were cast brilliantly. The battle scenes - although a little graphic - matched the realism of the opening scene of "Saving Private Ryan," walked the fine line masterfully by keeping it from being at all hokey, and put me on the edge of my seat. Those of you thinking "Naaa, I'm just not into those hokey sword and sandals movies," trust me! Go rent this movie if you haven't seen it on the big screen!!! There's nothing hokey about it. This isn't "Ben Hur" or "Sparticus" for the year 2000. This is an amazing and enthralling movie that just happens to be set during the Roman Empire in the 2nd century. A+ entertainment. Excellent flick. Go see it on the big screen. Russell Crowe was great. If you are a 100% commissioned salesperson this is a must see, otherwise you may not like it. Adapted from a theatrical production, this blockbuster gets to the heart of demonstrating the hard and soft sell. To save yourself some time go right to the part where Alex Baldwin tells Jack Lemon to, "Put that coffee down!!! Coffee is for closers!!" Baldwin does a kickass job of telling Lemon and his cohorts just how pathetic they are. Pacino, the smooth, soft talking winner, was the type of salesmen who sold my parents on, like, five time-share deals in the past six months. If you are a commissioned salesperson and your parents don't think that you provide a legitimate service to society because you are not a policeman, doctor, or lawyer then definitely do not let them see this movie! Once again, let me clarify--we rented these movies specifically so we could drink & mock them. In that sense, they were successful. Quick plot synopsis (using the term loosely): Young pretty girl catches attention of hot NYC DJ. Starts as backup to diva-type, but clearly sings better. DJ and producer both interested in making her a star but conflict about her career. DJ bets it all on one horse and helps her gain fame; meanwhile they fall in love (more or less). Success has pitfalls. Conflict between DJ and producer escalates. Honestly, I can't even remember how it ends, since by then I didn't really care. Maybe it's because it was later and we had had such sport with Britney's movie, but even mocking "Glitter" wasn't as much fun. Compared even to "Crossroads," "Glitter" is trite and predictable, with the added bonus of being badly acted and poorly paced. It seemed at times that the filmmakers were allowing the cast to improvise, perhaps hoping for some spontaneous magic. The result, however, seemed instead to be odd lingering lulls in conversation and some very dead, non-dramatic stretches. Knowing, of course, that Mariah Carey's real life was unspooling around the time the movie was made just makes it kinda pathetic; one almost feels too sorry for her to enjoy making fun. The fact that it's supposed to be semi-autobiographical makes it even worse. If, however, you don't let such sympathies get in the way of your sarcasm, I doubt you'll see a movie this year that's more mockable than "Glitter." Several lives and cultures (an innocent San bushman, a dictator, a volunteer teacher, a bumbling backwoodsman who has a crush on her) intertwine in this interesting concoction; a lot of silliness, but one of the most lyrical endings ever put on film (besides The 400 Blows, of course). The movie isn't perfect, of course; for one thing, a few of the interviews are cut off too early (in particular, I would have liked to hear more from Kerry's fellow vet and former senator, Max Cleland). In addition, the music is oddly pedestrian, especially considering that it was written by none other than famous minimalist composer Philip Glass. The good points more than outweigh the bad points, however. The footage of the Vietnam Veterans Against the War protests in Washington in 1969 is especially powerful, and brings home the tough decision Kerry faced when he contemplated throwing his medals away as an act of antiwar protest. All in all, this is an excellent movie to see if you want to learn more about the Vietnam generation; if you go away from it wondering if the best man won last year, that's fine with me, too. OK...sue me. I like mindless, action flicks. I am an "Armageddon" fan and have seen all the "Die Hard" movies a thousand times. I'm also a sucker for Nicholas Cage, Giovanni Ribisi, and, uh-oh...Angelina Jolie. By the way, if you're going to see this movie so you, too, can ogle Mrs. Billy Bob, rent "Girl, Interrupted." Angelina is in "Gone..." about 15 minutes. Anyhoo, this is mindless entertainment with hot cars, fast chase scenes, unrealistic get-aways, and some cute banter between the characters. Cage is the big brother of Ribisi, and is called on to help his little bro get out of a bad situation. Cage sleepwalks through his part -- he's a bland, bad-guy-turned-good, everyman. Ribisi looks like he just rolled out of some after-hours club and is looking for a "hit" of anything -- the ultimate grunge. And Angelina is wearing her lips. The movie is loud, raucous, and worth the $7.00. Just don't expect to be challenged. This movie is pretty good, and I give it 3.5 stars despite the fact that Jennifer Aniston's character was pretty much Rachel from "Friends," a little more depressed and with a passable Texas accent. Jake Gyllenhaal was very good. A little bit of a downer, but with some bright and very funny moments. Definitely worth renting. Read the book, saw the movie!!! Stephen King is a genius!! WOW!! Although the setting is death row, that fact is very much secondary to the focal point of the movie. In the end you are given a lot more to think about than the rigors of life on death row: Among the obvious are your own mortality and what you are doing with it, IMmortality - would it be a gift or a curse? -, and the balance of good vs. evil. Just about every movie attempts to move its audience in some fashion - The Green Mile is doesn't miss in this regard - there is lot to FEEL in this movie: Pure hatred and disregard for life, the ultimate struggle that goes through ones mind when faced with doing what is right, and the giving of love and kindness, and the great feeling when that love is returned. Interesting to me were the many death row "themes" or parallels running throughout the movie - the woman with the tumor essentially living on her own death row, and the feeling that the gift of living forever would, in many ways, be no better than living on death row. The movie was a bit longer than I thought it had to be and not exactly the cheeriest, but it certainly was moving, chilling and thought-provoking. Tom Hanks is the best of my generation. This movie and its supporting cast will undoubtedly be rewarded with a lot of critical acclaim. Having a soft spot in my heart for all the holiday cartoons, I couldn't wait to see this movie. 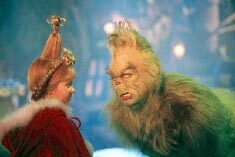 I thought Jim Carrey did a little too much "Jim Carrey" at times but still he was incredible as The Grinch. The makeup and effects were excellent. The movie strayed from the original at times which kept you guessing a little bit and made the movie more interesting (we now know why The Grinch hates Christmas). There are also a lot of little things happening in the background that you have to keep an eye out for, some of them very funny. The whole family really enjoyed this movie. I don't know why it was rated PG - everyone can see this movie and should. I bet it will put you in the mood for Christmas a little early this year. This movie is a dark comedy. Why is it that any comedy which includes death is a dark comedy? The film stars John Cusack and Minnie Driver as former high school sweethearts separated when Cusack mysteriously disappears on the day of the high school prom. Ten years later he returns for the class reunion and that's when the fun starts. Did I mention, in those ten years our hero has become a killer for hire? The movie chronicles the events that occur when Cusack's past and present meet in the days leading up to the reunion. The two lives present an interesting juxtaposition as they speed toward each other on a collision course. Everyone, except Steve Stremba, should enjoy this movie. Steve won't because he didn't like American Pie. Which I find disturbing, by the way. The only reason I didn't give it five stars is because nothing is perfect, except of course Our Pal.